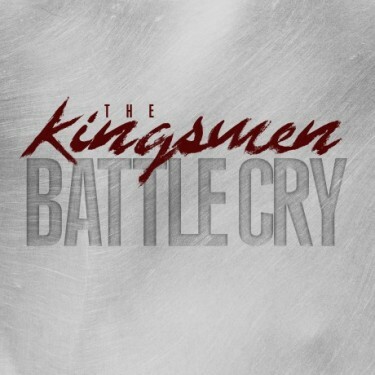 Let’s just get this out of the way right off the bat: Battle Cry is the best recording the Kingsmen Quartet have released in at least 12 years. The current vocal lineup of Chris Jenkins (tenor), Bob Sellers (lead), Randy Crawford (baritone), and Hall-of-Famer Ray Dean Reese (bass) have been at it for two and a half years, and this is our first opportunity to hear them on an album of new material. Battle Cry is worth the wait. With Jenkins’s seemingly effortless ultra-high notes and the big range of Sellers, the songs are keyed very high, and the sound is reminiscent of the Jerry Martin/Bryan Hutson/Parker Jonathan lineup, a personal favorite of mine. Battle Cry kicks off with the title track, an energetic march and call to action for the Church. For a lot of listeners, it should bring to mind the Cathedrals classic, “Bloodwashed Band”. It is a very solid performance and a perfect opener. That march is followed by a mid-tempo Rebecca Peck tune, “I’ve Never Seen the Righteous Forsaken”. This Jenkins feature is a home run, and my personal favorite cut on the album. Chris Jenkins was born to sing Kingsmen tenor, and he shows out here. Hit repeat! A new, but traditional-sounding, convention style song, “He Took Away My Burden,” is next. It’s not a likely radio single pick, but it is high on my list of favorites, as a fan of old-school quartet singing. The energy is cranked way up for the first barnburner on Battle Cry, “Oh Yes I Am”. Another stellar performance by Jenkins, it is a great choice for the first single off the album, and serves as notice to the listener that the high-octane Kingsmen sound is back and as good as ever. This recording contains two other excellent toe-tappers: warp-speed “Beautiful City” and my favorite, the infectious “Come and Dine,” from the pen of Dianne Wilkinson and Daryl Williams. That’s not to say that the Kingsmen don’t slow it down, and even modern it up, at times on Battle Cry. The recording contains three slower songs, all leaning just a hair in the progressive direction. A Sellers feature, “Cross of Grace” is a fairly standard progressive ballad, and is executed very well. “It Should Have Rained” is like most Dianne Wilkinson/Rusty Golden collaborations in that it’s just different, and in a good way. That is a Crawford feature, as is a song from his own pen, “Here I Stand Amazed,” which closes the album. There is truly no filler material on the CD, and even the deeper cuts are highly enjoyable. “I Know” is an excellent Ila Knight composition that sounds like a Kingsmen or Inspirations song from out of the 70s. The simply-titled “Faith” is a more modern mid-tempo number. Even though it’s not one of my top seven or eight songs on the recording, it would be one of the very top songs on a number of other recordings I’ve listened to this year. That’s how strong a collection Battle Cry is overall. For me, Battle Cry is without a doubt one of the two best quartet recordings of the year, along with Mark Trammell Quartet’s Your Walk Talks. It should appeal to a broad spectrum of gospel music fans just due to its execution. Traditional southern gospel fans will count it as one of the best of 2014.
needs to do their self a favor and get Battle Cry! You will not be disappointed! The Kingsman are a blessing to me. I truly love the song, He’s All I Need by Chris Collins. I downloaded the new album with the song by their newer tenor, the song is still beautiful. Why don’t the southern gospel quartets ever come out west? I love in Murrieta, Ca. I absolutely agree! I love Battle Cry! The Kingsmen are as good as they have ever been! Love Chris Jenkins and his beautiful tenor voice! Bob Sellars does an awesome job with the lead and Randall Crawford rocks it with baritone. And then there’s Ray Dean Reece…..couldn’t be singing any better! Love their music and what they stand for! If you don’t have Battle Cry, run to get it! Many blessings! Agreed!!! This is the best CD the Kingsmen have recorded in years – many, many years. Solid is the word that comes to my mind. It may be the best CD I’ve purchased this year, and I buy everything by L5, Triumphant, Greater Vision, Tribute, Blackwood Brothers, Dixie Echoes, Mark Trammell, Ernie Haase, Kingdom Heirs, Old Paths, Gold City – and the list goes on. I’ve never heard a CD with this much superb material. The vocals are off the charts excellent. This project MUST BE nominated for album of the year. Come & Dine is the perfect song to start the second half of a program!! !